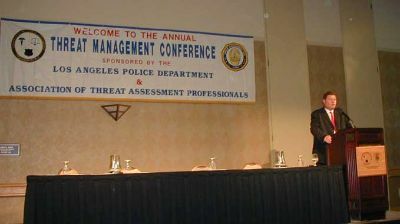 In August this year, Hamish addressed a threat management conference in the United States on behalf of the Association of Threat Management Professionals (ATAP) which works to protect high profile individuals. Hundreds of delegates from law enforcement agencies across America gathered in California to hear Hamish deliver ‘Stalking Solutions – The United Kingdom Perspective’. Hamish is available to give talks on stalking to law enforcement agencies and to those with a interest in tackling all forms of harassment including, domestic violence, workplace violence, stalking and child bullying. Please contact him for further information and bookings.